Warnie said it best in the Geelong price reveal – he’s a forward!! 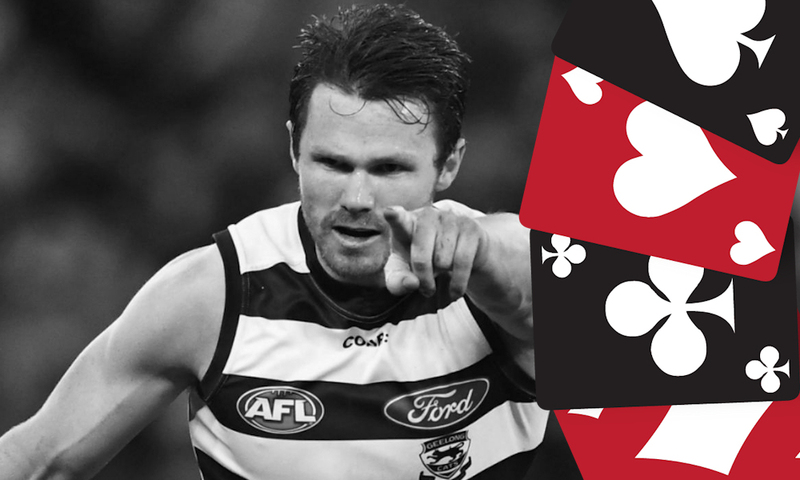 Everyone’s first picked player when AFL Fantasy opened was most likely Patrick Dangerfield and at the time of writing this piece, he is the most selected player in the entire game. At 58.61%, more than 22,000 coaches are starting with Danger in their sides right now, edging out Brodie Grundy (52.30%) as the most popular player and I’d only expect that number to grow before the season begins. So why is Dangerfield such a walk-up starter? The fact that he can slot straight into your midfield and/or forward line is a start. His dual-position status is due to the former Brownlow Medalist spending 37% of game time as a forward in 2018 per Champion Data, just above the required mark of 35%. While his goal-scoring prowess was down, kicking just 24 snags last season compared to 45 the year before, Dangerfield still managed to rack up plenty of the footy, even inside-50, ranking second in the club for touches inside the arc behind Tom Hawkins. I had a hunch that he wasn’t going to be called upon to spend as much time inside-50 this season and halfway through writing about the hottest commodity in fantasy, Gary Ablett & Chris Scott gave us a VERY promising sign. Dangerfield’s average of 106.4 last season saw him finish as the second highest scoring forward in the comp, a sliver behind Devon Smith’s 106.6 average. To put the scores from Danger (and Smith) last year into perspective, over the last five seasons there have been only been nine other instances of a forward averaging 105 or better, with a chunk of those players qualifying after gaining DPP status during the season. It’s hard to see the former Crow getting any worse than 105 again in 2019, after averaging north of that in four consecutive seasons. Prior to 2018, we saw Danger put forth two elite fantasy seasons going at an average of 119.2 in 43 contests. Throughout those two seasons, the star Cat scored under 85 just TWICE, showing great consistency with 35 tons and 14 scores 130 or better. Being able to slot Dangerfield into our forward line is a true gift from a higher power and there’s every chance he’s severely under-priced given his previous averages. The No.1 forward in Draft should see himself selected within the first few picks and it’s hard to find a reason why you wouldn’t start with Danger in your front six for Classic. If he is allowed to spend more time in the midfield this season, returning to an average of 110-115 is all but a formality. Do I really have to write something in this section? I mean Danger picks himself right now. There are no guarantees that we’ll see Danger in the midfield more frequently in the upcoming season, with competition for spots in the Cats’ engine room expected to be fierce. Not only will new recruits Luke Dahlhaus and Gary Rohan push for time closer to the footy, but the likes of Joel Selwood, Tim Kelly, Mitch Duncan, Gary Ablett and Sam Menegola already make for a cluttered bunch. Despite the pedigree of players at Geelong it’s tough to see everyone scoring at a high clip and there’s every chance Danger’s the odd man out. There were times last year where he didn’t look like the same fantasy talent we saw in the golden years of 2016/2017 as well, causing plenty of concerns for owners. Leading up to his Round 14 bye last season, Dangerfield ‘only’ went at an average of 100.3 points as he failed to top 120 in any of those contests with a hamstring complaint impacting his early output. If he does carry any niggles/injury concerns into the start of the season and is forced to play closer to the sticks then alarm bells could start ringing. After all, we are educated on how a rolled ankle can turn into a dramatic series of unfortunate events for Dangerfield. One could also argue that with Danger boasting such a high ownership percentage, opting to start without him and instead choosing a POD (player of difference), who is nowhere near as popular could be a risky, yet smart move. It would take some serious kahuna’s but, you could instead choose ‘Player X’, to save some money as Dangerfield is the second most expensive forward in the league this season costing you over $770K. ACE – The most selected player in the comp right now is exactly that for a reason. With a chance to offer a 10-15 point increase and at the very worst still average 100+, Dangerfield is must have property. He’s missed just three games in the last five years, he shapes up as the best forward available AND there’s a chance he’ll spend more time in the midfield this season only benefiting his fantasy potential. Lock. And. Load. Where would you take Danger in your Draft? I remember a time when the Deck was used for unique players with low ownership to give people a different prospective on Fantasy. I am highly considering using danger as an upgrade target at the start of the season. Risks of injury are higher, more time forward and the fact I can change my structure in forward line or upgrade a mid, is this worthy ? In 2018 4 rucks averaged over 100, 3 averaged in the 90s and 3 in the 80s. Three of this year’s forwards averaged over 100 last year, (Westhoff is in both groups), 6 averaged in the 90s and 22 averaged in the 80s. Three defenders averaged over 100, 2 in the 90s and 11 in the 80s (with Zac Williams needing to be counted in there somewhere). When you consider that Grundy had the second best average in the league and an average almost 9 points higher than anybody else covered by the above statistics, it becomes clear that Grundy should be the first player drafted. I’m not sure that Danger should even be number 2 when it is considered that Laird averaged more and quality defenders are in much shorter supply than quality forwards.